Spinning Tales: The Fabric of New Jersey tells the story of early America through the craft of spinning and weaving. The exhibit followed the process from gathering the raw materials to preparing the materials, to working the materials, and finally to fine finished products. The exhibit also provided first-hand documentation of the process through the reminiscences of Betsey Mulford Crane. Betsey Crane lived in the Morris County area and kept a record of her daily activities and those of her family and neighbors in her diary from 1824 to 1828. Before beginning the process of creating fabric, families had to gather the raw materials they used to create it. The two primary materials used in early America were flax and wool. Each material had its own process used to change it from its raw form into a fabric. The durability of the fabric was very important as the fabric was supposed to last many years. This fabric would be passed on from generation to generation, the pieces becoming smaller and smaller with each use until they finally ended up as colorful squares in patchwork quilts or as strips woven into braided or hooked rugs. The creation of linen begins in the spring when flax is planted in wet areas of the fields. By late summer, it is ready for harvest. After harvesting the flax is “retted” or submerged in water to remove leaves and other plant matter. 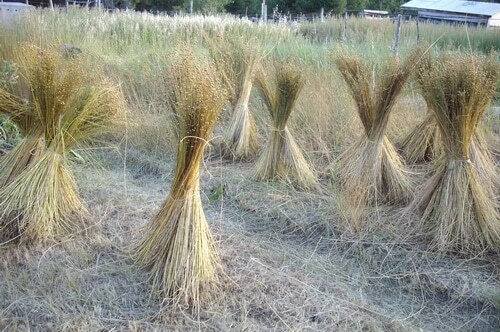 After retting, the flax is spread out and dried. Once the flax is dried it is then “broken” using a flax break. A handful of flax is positioned perpendicularly between the wooden planks of the break and the hinged middle plank is brought down on the flax, breaking the fibers of the plant to remove the coarse outer layer and expose the inner core or the linen fiber. After the flax break, the fibers go through a process called scutching to remove any extra wood parts from the fiber. The last step of the flax plant’s transformation is called hetcheling or hackling. During this step, the fibers are pulled through a hetchel, or a small board with nails pointing up, which separate the fibers and remove the final impurities. There is quite a loss of fiber in this stage as short and broken fibers are also pulled out through the hetchel. The broken fibers are combed and hetcheled again to produce a coarser thread. Once the flax has been changed into linen fibers it then needs to be spun into thread using a spinning wheel. To make it easier to spin into thread, the linen fibers are spun wet. Spinners keep a container of water nearby and dip their fingers into water frequently to smooth the fibers. Rainy days are preferred for spinning linen thread as there is more moisture in the air. Linen thread is spun counterclockwise because that is the natural direction of the flax when it is growing. Once the linen thread is spun it is ready to be woven on a loom. Refer to this video of the flax-to-linen process from the Clark County Historical Society. Farmers shear their sheep in the spring, cutting off the warm wool the sheep grew in the winter to prepare them for the warm summer months. The sheep are sheared using metal wool hand shears. Shearing an entire flock was a process that took days. The shorn wool or fleece that is removed from the sheep contains a large amount of oil, lanolin, and organic matter accumulated during the sheep’s daily life. Thus, the wool needs to be washed. In early America, the wool would be submerged in lye soap and water, which left only the usable wool. After the wool dries, it is picked apart by hand in order to loosen up the fibers from the matted form they had while wet. When the fibers are more weblike, they are put through a series of steps called carding. Carding is a process that involves pulling the wool fibers through either a drum or hand carders in order to spread out the fibers and ensure that they are are facing the same direction. This is important for the next step of spinning. Next, the fibers are spun using a spinning wheel or a drop spindle in a clockwise direction. The spinning wheel twists the fiber through a spinning motion caused by the rotating wheel. A drop spindle requires the user to twist the fibers with the right hand while the gravity continues the twist on the turning suspended spindle. For one demonstration of how this process might work, refer to this video from a farm advocate currently based out of New York. There are many different tools that weavers use when making cloth from spun thread. These items help with transferring the spun wool or linen to the loom where it is woven into cloth. Once the wooden bobbins on a spinning wheel are full, the thread needs to be transferred from the spinning wheel using either a clock reel or a Niddy Noddy. Both of these tools help spinners know how much thread they have created. For a clock reel, spinners thread their spun fibers onto the reel. The clock reel clicks as every successful turn was accomplished, allowing the spinners to know exactly how much thread they had spun by counting the clicks. Spinners could do the same thing by hand using a Niddy Noddy, winding the thread around the two heads of the tool. Thread would be used on different standing looms depending on the size of the fabric being created and the type of thread being woven. Weaving a usable amount of fabric often took a large amount of time as the loom had to be first threaded with the yarn before the weaving of the thread could begin. Once started, however, a good weaver could weave a sizeable length of fabric in a short time. To see how a linen loom worked, check out this video from our fellows in history at Mount Vernon. Dyeing the thread and fabric adds to the beauty of the spun and woven materials. The many colors come from plant materials such as berries, flower blossoms, leaves, and nuts. In order to make a dye solution, one first chops the dye material into small pieces and places them into a pot. Next, double the amount of water to plant material is added so that all the material is covered by water. The mixture is brought to a boil and simmered for about an hour. The remaining plant material is strained out, and the liquid left over is used to dye the thread or fabric. Before the fabric is placed in a dye bath , it must first be soaked in a color fixative that makes the color set better in the fabric. For berry dyes, the fixative used is salt-based: 1/2 cup of salt to 8 cups of cold water. For other plant-based dyes, the fabric is soaked in a vinegar fixative: 4 parts of cold water to 1 part vinegar. Once the fabric is soaked in the fixative, it is ready for the dye bath. Most of the dyes used by early Americans used the sight test method of dyeing, where the fabric was pulled out of dye bath when the color of the fabric was the color the dyer wanted. Refer to this video from Colonial Williamsburg that talks about the materials used in dyeing fabric in early America.